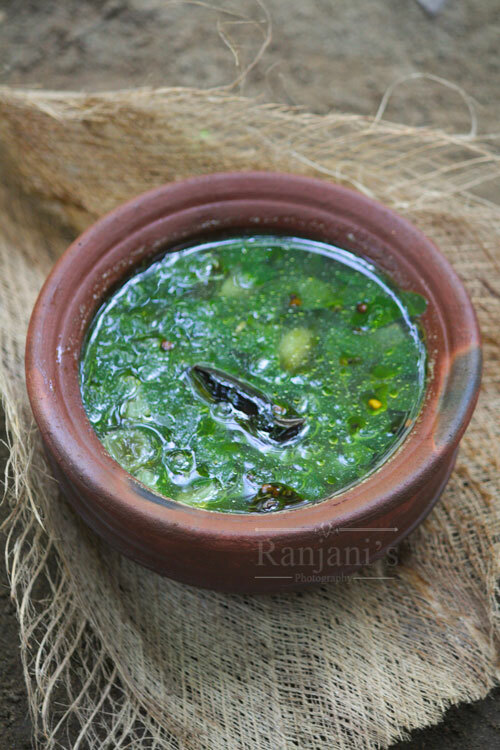 Murungai keerai rasam recipe – Iron-rich healthy recipe to have with rice. You can have it as soup also. I used soaked rice water to make this drumstick leaves rasam. You can prepare using water extracted from cooked rice or cooked dal.We must include this healthy keerai recipe at least twice in a week in any form like murungai keerai poriyal or murungai keerai sambar or as rasam. Whatever method, it’s your own favorite choice. Because the intake of drumstick leaves will do so many wonders particularly in women’s health. Will you believe it regulates your menstrual cycle if you have irregular periods? Yes, it will. So friends try including this healthy leaves in your diet plan at least once in a week. Click here to know more about drumstick leaves. Scroll down to see steps for how to make murungai keerai rasam recipe. Soak the rice you going to use for lunch. Drain the water and keep it to make murungai keerai rasam. Clean the drumstick leaves without any yellow leaves and stem. Grind pepper and cumin together as coarse powder and keep aside. Chop the shallots very nicely and keep it aside. Heat a pan or kadai, add oil, once it gets heated, put mustard and when it splutters add jeera and curry leaves. Then add onions and red chilies and saute well. Add rice water to it. When it starts boiling, add drumstick leaves,rasam powder, pepper jeera powder and salt. Allow it cook for 8 minutes covered with a lid. You have a great website. This one is my favorite. I can have drumstick leaves in any form. Healthy recipe to have it with rice. It doesn’t even take more than 10 minutes to cook. It’s very easy and fast to cook with delicious taste.